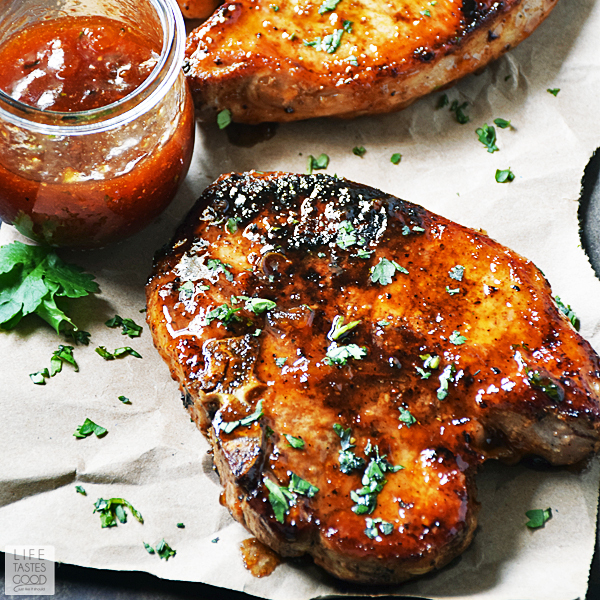 Chili Rubbed Pork Chops with Apricot Ginger Glaze is one of my absolute favorite recipes! It's an easy recipe on the table in under 30 minutes and the flavor will knock your socks off!! It's a little bit spicy, a little bit sweet, and a whole lot delicious! Easy Pork Chops are on the menu this week for Sunday Supper. Pork has been growing in popularity for a few years now. It could be a result of the USDA lowering the safe cooking temp for pork in May of 2011 to 145°F, declaring pork safe to eat when cooked mid-rare. Pork will be slightly pink inside and more tender and juicy when cooked mid-rare. Restaurants have been cooking pork this way for years before the USDA lowered the safe cooking temp, but now everyone can enjoy tender, juicy, restaurant quality pork at home. I'm pretty passionate about pork. Pork is relatively lean and packed with protein, and when cooked properly, it is tender and juicy and tastes great! Additionally, I love that pork is economical and versatile too. You can enjoy pork chops on a regular basis because they are relatively cheap compared to some other proteins, and they can be cooked a variety of ways. This rub is quick and easy to put together. I recommend rubbing the chops the night before for best results. This rub is a bit spicy on its own, but when paired with the apricot ginger glaze the taste is perfectly balanced with sweet and spicy flavors. I've used this rub/glaze combo on other cuts of pork and even chicken too. It's often my go-to recipe for company because everyone absolutely raves about it. Purchase center-cut pork loin chops with the bone that are at least 1 inch thick. I like them to be between 1-1 1/2 inches. If you get them too thin they tend to overcook before getting a good sear on them. Too thick and they take longer to cook, but too thick is much better than too thin. 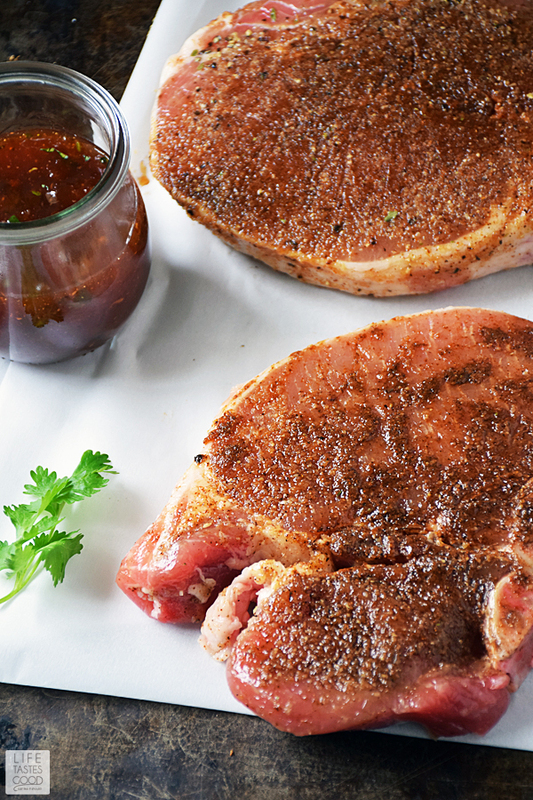 Rub the pork chops with the dry rub the night before for best results. Wrap the rubbed pork chops in plastic wrap and refrigerate until ready to use. 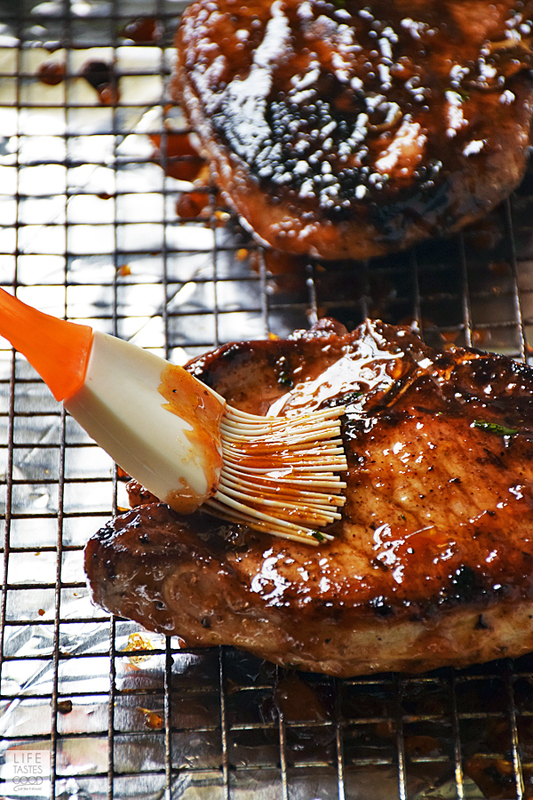 Prepare the glaze while the pork chops are searing. 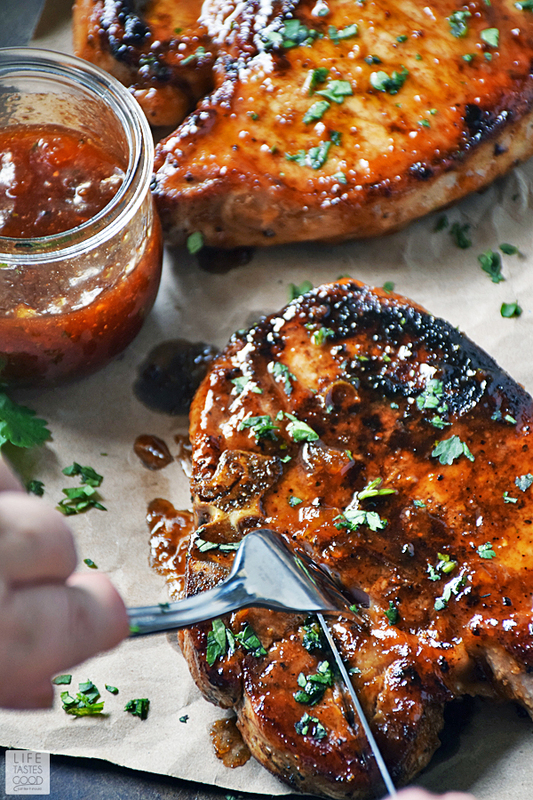 It's easy to prepare and have ready when the pork chops are ready to glaze. Be sure to use the fresh ingredients called for in the recipe. Fresh ingredients maximize flavor for best results. Using dried ginger or cilantro will yield a different flavor and won't be as good. When purchasing fresh ginger, break off a small piece to buy what you need. I usually buy a thumb sized piece of ginger and freeze any I have leftover for the next time I need it. For a super easy dinner, this pairs nicely with a garden salad, but if you want a more substantial meal or you've invited guests for dinner, I recommend serving this with garlic mashed potatoes and freshly sauteed spinach. The sauce and the mash go great together! 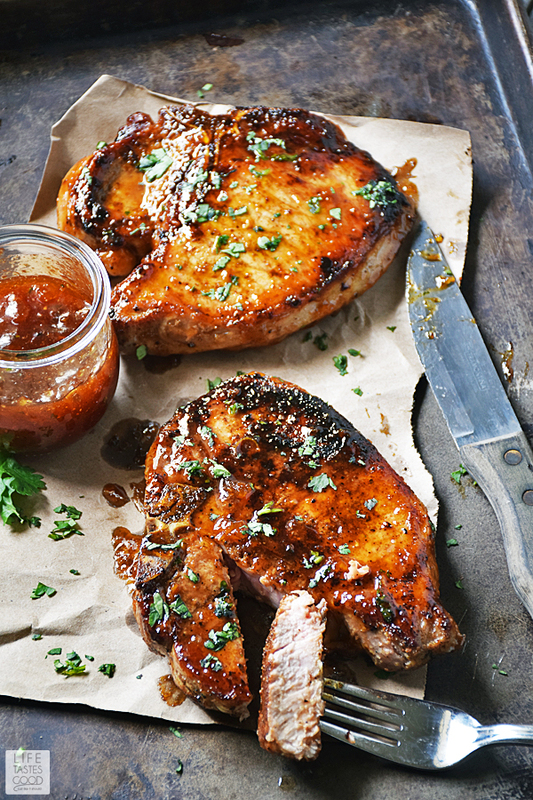 Chili Rubbed Pork Chops with Apricot Ginger Glaze is one of my absolute favorite recipes! It's an easy recipe on the table in under 30 minutes and the flavor will knock your socks off!! Preheat oven to 350°F. Line a baking sheet with foil for easy cleanup and place a baking rack on top of the foil so it sits inside the baking sheet. I recommend using a baking rack for best results when basting the chops, but if you don't have on hand, you can place the chops right on the foil if needed. The night before cooking or early in the day, combine 1 tablespoon chili powder, 1 tablespoon garlic powder, 1/2 tablespoon sugar, 1 teaspoon kosher salt, and 1/2 teaspoon freshly ground black pepper in a small bowl. Stir to incorporate. Divide rub evenly and rub on pork chops being sure to get on all sides. Wrap pork chops in plastic wrap and refrigerate overnight. To cook the pork chops, heat a large cast iron skillet over mid-high heat until screaming hot. Add 2 tablespoons butter to the skillet and place pork chops in the pan in a single layer. Sear the chops for 4-5 minutes to get a good sear on the one side. Turn the chops over and sear the other side for 3-4 minutes. Check the internal temp by inserting an instant read thermometer into the center of the thickest chop. If it reads 135-140°F remove the pork chops and place them on the prepared baking rack. While the pork chops are searing, melt 3/4 cup apricot preserves in a microwave safe bowl on high for 30 seconds at a time until melted. Stir in 1/4 cup of the BBQ sauce, 1/2 teaspoon freshly grated ginger, 1/2 teaspoon garlic powder, 1/4 teaspoon hot sauce, 1/2 tablespoon freshly chopped cilantro, and the juice of 1/4 of a small lime. Stir to combine. Give it a taste and adjust the flavors as needed. Transfer half of the glaze to a serving dish and save to serve with the finished pork chops. Baste the pork chops on all sides with the remaining glaze and place in the preheated oven for 5 minutes. Remove from oven and let stand for 5 minutes to rest. Serve with reserved glaze and enjoy! NOTE: If your pork chops are extra thick and aren't up to temperature after searing, they will require more time in the oven, so be sure to check the internal temperature before the rest time. The internal temperature before resting should be 140°F give or take a degree or two. Those look absolutely incredibly delicious! That glaze!! Oh that glaze! I want to reach through the screen and grab one of those chops. The caramelization on these is absolute perfection! I love adding fruit to savory dishes. The look of that glaze is incredible and the recipe sounds just as delicious to match. These were fantastic! 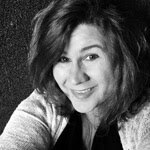 They had so much flavor my husband told me to write this recipe down and add to our other favs! Thanks!